In this post we're going to talk about a team in a competition what entered a few days ago and got the championship. A well-known story in the world of football and we want to remember here today. 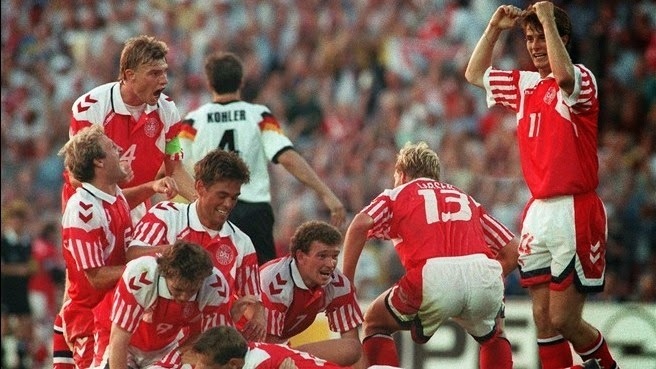 Denmark failed to qualify for the finals in Euro 92 but entered in competition thanks to the expulsion of the former Yugoslavia since war grounds facing the country, Balkan War. The championship was played in Sweden, as in the phase of groups, Sweden eliminated two powers like England and France. In the semi-finals they faced the Netherlands of Marco Van Basten, European Footballer of the Year and Ballon d’Or that year, surpassed it in penalties. In the final in Gothenburg, Denmark beat Germany by two goals to nil. Highlights as a player Tournament Peter Schmeichel, legendary player Danish football and Manchester United, who had a great performance against the Netherlands on penalties and in the final against the almighty Germany. We leave a summary of Informe Robinson (Canal +), where it counts this impressive history.